Dental Implants in Scripps Ranch, CA: What Are They? Did you hear the news? San Diego has $352,000 to give away in overpaid taxes and fees. See if your name is on the list. What would you do with a sudden windfall? If you’re like many patients missing one or more teeth, you should treat yourself to the best in tooth replacement: dental implants. They’re the only comprehensive option available today, as they give you back the missing tooth and its root. What are the different parts of a dental implant? And how to know if you’re a candidate for dental implants in Scripps Ranch, CA? Let’s take a look at these and other important questions regarding your tooth replacement. Implant: The implant itself is a small cylinder, or screw-like post, that is buried beneath the gum line. Here, it heals together with the jawbone, fusing into one solid unit. Once the process, known as osseointegration, is complete, the dental implant is as sturdy as your natural tooth’s root. Abutment: Because the dental implant is placed below the gum, it requires a connector to support the prosthetic tooth. The abutment fills this role. 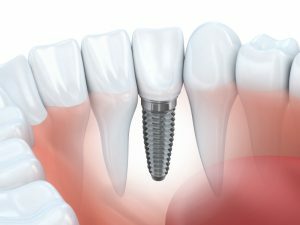 Once osseointegration is complete, the dental implant is exposed once more and the connecting abutment is placed on top. More healing is required for the gum tissue. Crown: The crown is the part that you see. Dental implants can support one crown for single tooth replacement, or a full or partial denture for replacing several or a whole row of missing teeth. Because multiple procedures and long recovery times are required with dental implants, the whole treatment takes time to complete. You should expect your dental implant procedure to last six months to one year. Patients who do not have adequate bone structure to begin with will require bone augmentation, which lengthens the overall treatment time (see below). If you would like to replace your teeth with the best option available today, schedule an appointment with your implant dentist to find out whether or not implant dentistry is right for you. Dental implants enjoy a 95 percent success rate in eligible candidates. In general, patients should be in good oral and overall health to benefit from dental implants. First, dental implants require plenty of supporting jawbone structure. Patients who have lost a significant amount of bone due to their missing teeth may require bone grafting before dental implants can be placed. Bone graft, sinus lift, and other bone augmentation procedures add months to the overall treatment. Second, patients should be in good oral health, too. Successful dental implants require healthy gum tissue, so cases of periodontal disease should be treated prior to receiving the dental implants. Let’s Talk Tooth Replacement Today! The only way to know for sure whether or not dental implants are right for you is to schedule an appointment with Dr. Friedman, your dentist in Scripps Ranch, CA. Request an appointment today!